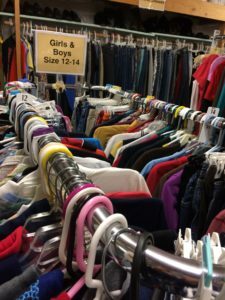 June’s Kids Kloset serves families in the greater Philomath area by providing clothing, diapers, layettes, and other necessities for their children. It is one of the few places in the local area where children can get back-to-school shoes, winter coats, boots and other clothing items that many of us take for granted. Our volunteers accept new and gently used clothing items that are washed and ready to hang. Clothing sizes that we accept and distribute are for newborns through high school ages. Note, we do not accept furniture but if you want us to pass your name along to a needy family, you can leave your phone number with us by calling 541-929-2499. In 2018, June’s Kids Kloset served 954 individuals averaging 55 children per month. Note: June’s Kids Kloset will be closed whenever Philomath schools are closed for snow days. June’s Kids Kloset is looking for a volunteer manager and volunteers to work in the store. The manager commitment would take 6 – 8 hours per week and the volunteers can commit to any hours on Tuesday or Thursday. You can call 541-929-2499 or go to our volunteer page to apply.